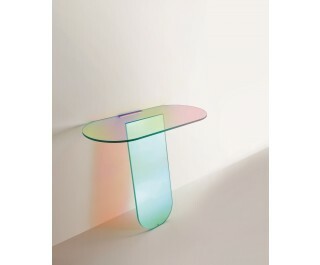 High tables, low tables and consoles in laminated and glued glass, characterized by a special iridescent multichromatic finish; the nuance varies according to the angle of the light source and the vantage point. Reflected objects with a magical and ethereal appearance emerge. Available in acid-etched or transparent glass. The high tables bases can be dismantled and are fixed to the top by means of metal plates, concealed by a circular decorated covering.